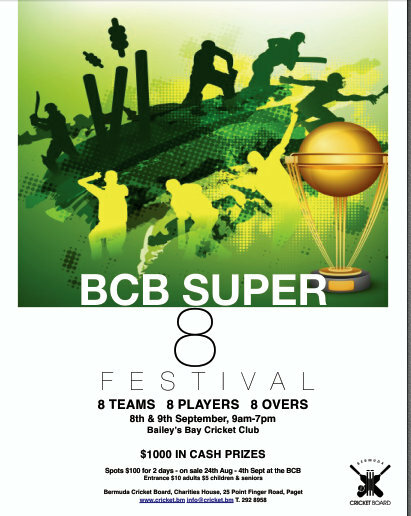 The Bermuda Cricket Board (BCB) announced a new and exciting Super 8 Festival to be held at Sea Breeze Oval on September 8th and 9th. The competition will feature 8 teams, with 8 players, playing 8 overs per match over the 2 days with each team guaranteed a minimum of 4 matches and $1000 cash prizes up for grabs. So, if you like the T20 format, this is faster and more exciting. We are hoping to create that Eastern Counties environment, so we need you to come out and support your team. Entrance fee will be $10 per person, children and seniors will pay $5. Spots are available for purchase for $100 for both days from Friday August 24th at the BCB office (292-8958 or email info@cricket.bm), and if there are any vendors interested in the opportunity, please give our office a call for pricing. The tournament will be played from 9am-7.30pm each day. On Friday September 7th at 12 noon, the Captains of the teams will have a draw for the placement of their team on the schedule, and then on Saturday teams will play for seeding positions with 3 games each. Sunday will be the knock-out stage based on the team’s positions from the previous day.